Hazard: The tub’s heated seat can get stuck in the “on” position. If a towel or other item is covering the seat of an empty tub, the seat can overheat, posing a burn hazard to consumers. Consumers should not put a towel or other item on the seat and contact Oliver Fiberglass for new instructions and warning stickers to place on the tubs. 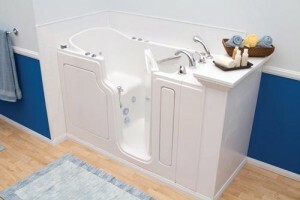 Oliver Fiberglass is contacting tub owners directly. Consumer Contact: Oliver Fiberglass toll-free at (888) 492-9423 any time, or online at www.safesteptub.com and click on the Recall link on the Safe Step homepage for more information. 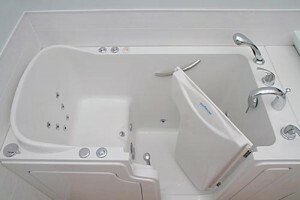 Description: This recall involves Safe Step walk-in, hydro-massage bath tubs with heated seats. The recalled tubs have model numbers LP2848, LP2851, LP2853, LP3153 or LP3255 and serial numbers 124423 through 131569 containing the prefix HS, HSHY, HSHS, HSMB or MBHS. The model and serial numbers are located on the back of the small access panel on the faucet end of the tub. Incidents/Injuries: There have been 11 reports of the empty tub’s heated seat getting stuck in the “on” position, including one report of the seat overheating and becoming hot to the touch. No injuries have been reported. Sold at: CKH Industries, New Windsor, N.Y.; Galkos Construction, Huntington Beach, Calif.; Gulf Atlantic Home Solutions, Clermont, Fla.; Home Smart Industries, Aston, Penn. ; IPS, Hohenwald, Tenn.; New Bath, Jefferson, La. ; Remodel USA, Capitol Heights, Md. ; Safe Step of Minnesota, Burnsville, Minn.; Safe Step of Nevada, Las Vegas, Nev.; Safe Step Tubs Northwest, Tukwila, Wash., and Safe Step Walk-In Tub Co., Nashville, Tenn. from January 2014 through September 2014 for between $12,000 and $15,000. Manufacturer(s): Oliver Fiberglass Products, of Hohenwald, Tenn. (tub shell) and NuWhirl Systems Corp., of Corona, Calif. (heated seating equipment). Distributor: Safe Step Walk-In Tub Co., of Nashville, Tenn. Previous: Leak somewhere in the plumbing in my shower/bath? Next: The bathroom faucet does not drip UNLESS the toilet is flushed or some other faucet is turned on. We were redesigning our bathroom not so long ago and got rid of our traditional tub. We bought walk in tub and for now (3 years and counting) we can not be happier about that decision. The redesigning of a bathroom can really make your bath hours much happier. I personally use faucets and hand showers to enjoy the water.